It was, in the words of the New York Times, “an unlikely Broadway survivor.” The 39 Steps, a critically acclaimed stage adaptation of the 1935 Alfred Hitchcock movie, ended up running for two years on the Great White Way, despite the lack of a starry cast, stunning sets, or shocking subject matter. More recently, it has become a favorite of regional theaters such as PCPA Theaterfest, which presented an acclaimed production last year. Ensemble Theatre Company jumps on the train this weekend, when its own staging, directed by Broadway veteran Jamie Torcellini, opens at the Alhecama Theatre. But the main appeal seems to be the thrill of watching a motion picture be re-created on a stage through the clever use of lighting, sound, and a handful of props. “We create all these different locations with a couple of boxes, some ladders, some sheets, and a couple of chairs,” Torcellini said. And, of course, actors — four, to be exact. One portrays the hero, Richard Hannay, who finds himself chased by both the police and foreign agents when he stumbles across a spy ring. Another plays the three major female characters. The two remaining cast members play all the subsidiary roles — somewhere around 30 apiece. Aside from seeing (and loving) the Broadway production, this is Torcellini’s first experience with the show, although he’s very familiar with this style of theater. As an actor, he won a 2011 Indy Award for his work in the multicharacter farce The Mystery of Irma Vep, which ran last season at both the Ensemble and Rubicon theaters. Torcellini stressed that while the acting will be somewhat stylized, in the manner of a 1930s film, it will not be campy or over-the-top. The romance between Hannay and the woman who becomes his unwilling companion will be played for its emotional resonance, not as a joke. But there will be jokes — verbal puns, musical quotes (listen for music lifted from Bernard Hermann’s great scores to many Hitchcock films), and, of course, sight gags. Torcellini promises visual references of “iconic Hitchcock moments” from such films as Rear Window, Vertigo, and North by Northwest (think crop dusters). “I’ve also thrown in some obscure ones, which no one may get,” he said with a laugh. 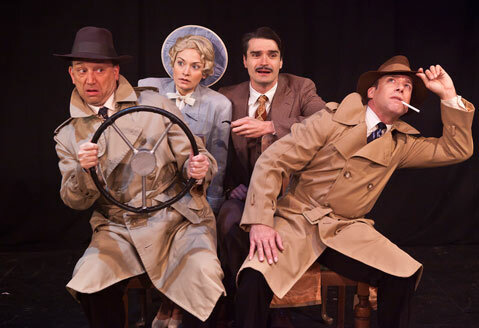 Ensemble Theatre Company presents The 39 Steps previews on February 2 and 3 at 8 p.m., with performances continuing February 4-19 at 8 p.m., at the Alhecama Theatre (914 Santa Barbara St.). Call 965-5400 or see ensembletheatre.com.